People who think of Detroit as the Motor City aren’t always aware that it has an active bicycling culture that is helping to reinvent the city’s image. Those biking enthusiasts are about to get a feature that the world’s most bike-friendly cities have: protected bike lanes. The Detroit Free Press says construction will begin soon on Detroit’s first dedicated lanes for bicyclists. 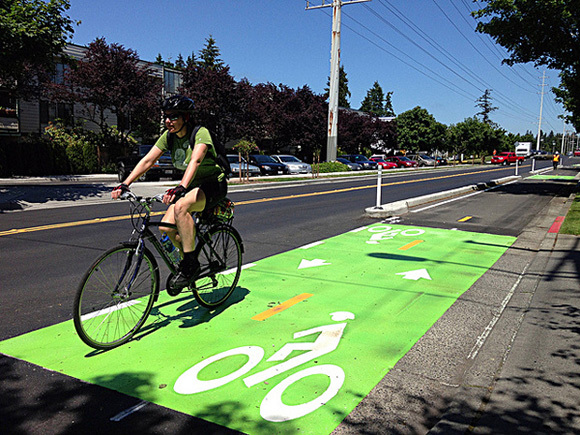 These are different than just the bike lanes you see painted on ordinary city streets. Protected bike lanes are separated from traffic by barriers. The lanes are clearly designated for use by bicyclists, which keeps them from having to dodge parked cars and avoid motorists. The lanes can be found in cities around the world, from Copenhagen to Chicago. Unlike those places, Detroit’s project is a modest one. About a half-mile of lanes are being built on Jefferson Avenue, on the city’s east side, near its border with Grosse Pointe Park. That’s a sharp contrast to the 170 miles of painted bike lanes that have popped up across the rest of the city since 2006. But the Free Press says that there are plans to expand the lanes farther west on Jefferson Avenue to East Grand Boulevard, and eventually to downtown Detroit. Great news. I hope they build some on Woodward with the new light rail.